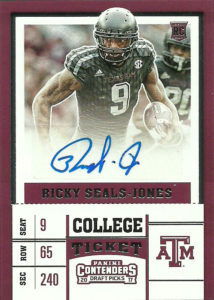 Ricky Seals-Jones originally committed to the University of Texas as the #1 WR in the nation, but had a change of heart and went to A&M instead, because the Longhorns wanted him to focus on just football and not basketball too. At 6’5″, 243, with good blood lines (he’s a cousin of Eric Dickerson), Seals-Jones caught 123 passes for 1442 yards and 10 TDs during his time at A&M. After his Junior year in 2016, he declared for the 2017 NFL Draft. He was not selected and signed with the Arizona Cardinals. With good size and a considered an effective blocker, it looks like Seals-Jones would be making the switch to tight end at the pro level. He started on the practice squad in 2017 and was elevated to the regular team roster around mid-season. Ricky caught his first two professional touchdowns against the Houston Texans.